The new Distortion III joins the ranks of MXR classics—such as the Phase 90 and Dyna Comp—setting a new benchmark in distortion tone and quality. Developed from the ground up using carefully selected components, the D-III delivers everything from sweet singing overdrive to massive distortion crunch! It's natural and amp-like distortion is versatile enough to appeal to any playing style and transparent enough to let your guitar's personality shine through. 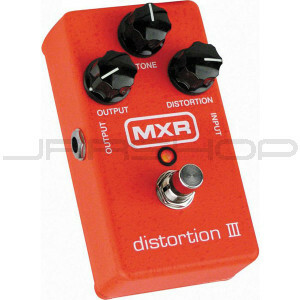 Like all MXR pedals, the Distortion III features a heavy-duty casing, switch and jacks for a lifetime of use.